Enigmatic, surreal, futuristic and deeply mysterious are the keywords to best describe Zanov’s 3rd album “In Course Of Time”. Legendary French synthesist Zanov, aka Pierre Salkazanov, already started work on this landmark album before his last concert in Villebon (near Paris) in June 1978, followed by some significant changes in 1979. The tracks of the classic recording ended up on different tapes, the first composition being “Sky Energy”, followed by “Lost message” “Phantasm”, “Infinitude”, and the title track “In course of time”. In the creative process, Zanov made extensive use of the VCS3, ARP2600 & RMI Harmonic Synthesizer (at that time he didn’t yet have the Korg PS3300) and recorded the outcome on the TEAC3340S. 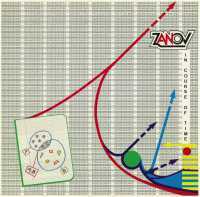 The music on each of the five tracks turns out as Zanov’s most advanced and accomplished effort until then. Just after the end of his 5-year contract in December 1981, all music finally fitted the bill according the composer. The recording was eventually released on vinyl in 1982 on the French Ondes-label and the Canadian Les Disques Solaris. All in all, “In Course Of Time” is a journey through the ever expanding universe of electronic sounds, ending up as brilliant, innovative and ahead of its time.